Other Products: Smooth white cardstock, Paper distressing tool or sharp scissors, Foam tape, Gold metallic sheet, Distress Inks Peeled Paint and Salty Ocean and Zig Markers. Instructions: The ready side-fold card from smooth white stock measures 5 3/4" by 7 3/4". To create the top panel, choose the paper from the designer paper collection and cut to size measuring 5" by 7". Further cut the paper into 5 strips measuring 1' by 7". Distress all the stripes with Peeled Paint first and then with a distressing tool. Layer all the strips using foam tape on white cardstock measuring 5 1/4" by 7 1/4". Choose a teal color paper from the paper collection and hand tear it as shown. Wrap the paper around the panel as shown, sticking both the sides behind the panel. Cut a top piece of fancy lace from the ornament Noel Ornament Die in teal blue color and adhere it on the left side of the panel as shown. Further layer the ready panel on the golden metallic sheet and finally on the card base. Cut one piece of a circle using outer most die from Eyelet Circle & Basics Small Die Set, one piece each from 2nd and 3rd largest die from white cardstock. Distress them using Peeled Paint and Salty Ocean distress inks. Layer all the circle die cuts one on top of each other and further layer the painted snowy village on top. For Poinsettias, stamp the images from Poinsettia & Holly Clusters Cling Stamp Set, using Plum Archival, color them using Magenta Hue and Vermillion and cut them using their coordinating dies. 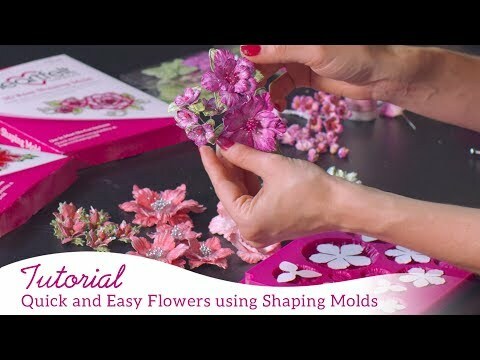 Once cut and painted, shape them using Poinsettia Shaping Mold and add prills to their centers. The pine leaves are stamped with Archival Fern Green and painted with Leaf Green archival ink. 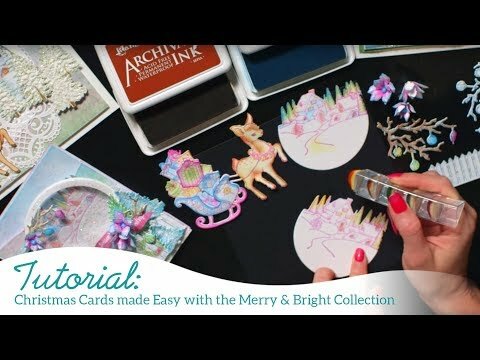 Once all the elements are ready, assemble the card as shown and glitter the edges randomly to add an extra accent to the card.